In the strengths column is the surprisingly good ability to use the establish characters well. There was never really a moment where any main cast member didn't act as TOS established they should. More importantly the new character moments were well telegraphed, not disabled at all by the medium. In "Albatross," for example, the banter between Spock and McCoy felt and resonated exactly as it did in their live action counterpart. I also enjoy how the episodes expanded on old plotlines, by and large, in new ways. Very few of the revisits to the TOS stories felt like mere retread. 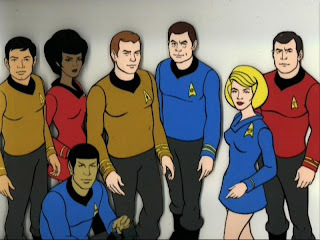 The inherent weakness of a 22-minute cartoon is that it doesn't leave a lot of time for slow-burning narrative development, so they have to borrow what TOS established. Given that, they did it well. The other great strength was, by and large, taking wonderful advantage of the freedom that animation provided. The ship in "Beyond the Farthest Star" was absolutely beyond the reach of TOS and beautifully rendered in animation, for example. It was really pleasing to see the creators have less of a leash on their imagination. On the weaker side, when TAS stumbles, it does so hard. The weaker episodes like "Bem," "The Infinite Vulcan", and "Jihad" leave the viewer overtly perplexed by what the hell just happened. Failing to hold my interest for 22 minutes is a bigger sin than failing to hold it for 50. Even questionable choices in voice acting or art direction could derail an episode more readily than a similar mistake in the live action counterpart and render an episode a little straining to watch. Especially toward the end, there seemed to be a lot of those episodes. Also, and again, this was probably due to the nature of the format, but there were fewer heights. "Yesteryear" stands out as going toe to toe with prior TOS greats like "City on the Edge of Forever" or "The Enterprise Incident", but there aren't very many episodes that, while good, make you say "Wow, that was great Star Trek." If there's one thing that bugs me about TAS, it is a lack of ambition. I think it got pegged as a "kiddie" show, and thus received less TLC when it came to really developing plots. Thus, despite a few gems like the aforementioned "Yesteryear," which is not coincidentally a D.C. Fontana production, many plots, while containing the germ of a good episode, failed in execution. A lack of real actors to watch hampered shows that otherwise might have reached into average territory. It is a lot easier to forgive plot issues when you have a living, breathing, charming actor to empathize with and admire. All that said, I do still think this is a worthy watch and purchase, especially for a TOS fan, and for enthusiastic historians of Trek (and I count myself as one). Is it canon? After finishing up the whole series, I'm going to say no. It's just too uneven, and it seems hard to justify picking and choosing. I think there are whiffs of canon here and there, but only "Yesteryear" holds up as canonizable. 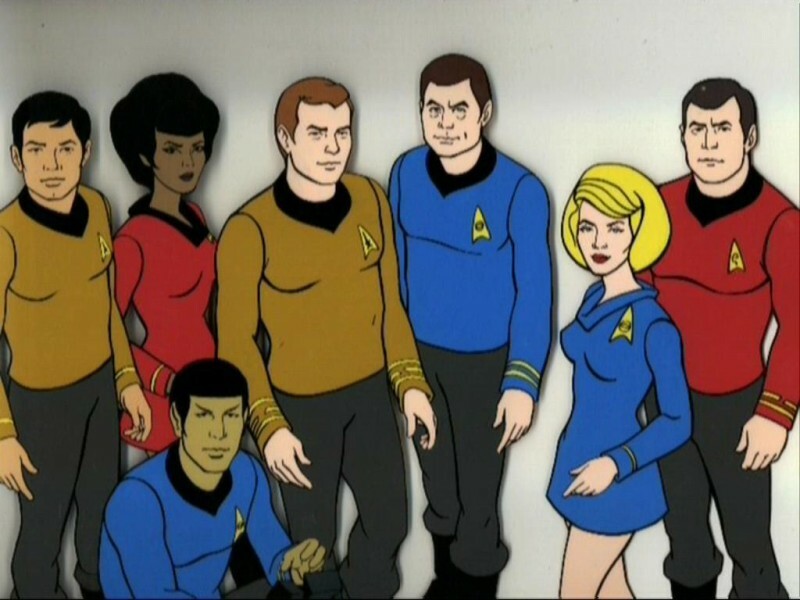 Elements of "Yesteryear" were picked up in the 4th season of Enterprise, and I think that is the best way to imagine TAS in terms of canon. It suggests things, but it isn't irrevocable, and can be referenced or not at the discretion of future Trek producers (or, as would likely be the case with J.J. Abrams, completely contradicted and ruined at will). Here's a chart of the ratings. Kevin: It may seem unfair to judge so different a show by the same criteria, but I don't think that's true here. I treat these episodes the way I would treat a TOS episode because that's how the creators, without exception, treated the show. I agree with Matt that the stories feel less developed, but I'm willing to give the creators the benefit of the doubt that was lack of time, not lack of will. Based on several interviews with the creative staff on the DVDs, they meant this as a fourth season of TOS, and that's how I analyze it. Whatever other flaws the series may have, one thing that will endear it to me is that the people involved took it seriously and it shows, even in the weaker episodes. I am a little sad that the show couldn't stay above an average of 3, but a handful of clunkers in the show's homestretch sealed the deal on this one. All that being said, provided you are a fan of TOS, this show is definitely worth the watch. Matthew: With regard to judging this by the same criteria, I feel it's only fair. There is certainly an effort at maintaining verisimilitude and cohesion with TOS. The voice actors are back, the general rules of the universe stay the same, and continuity references to past episodes abound. It's pretty clear that were are supposed to take this as the same thing as TOS, not a phony simulacrum. And, as you see above, by the same criteria, TAS falls a bit short of average Trek. For the most part, I think the fault for this lays on some half-baked stories. The process of "running" a show and really subjecting proposed scripts to scrutiny will separate the wheat from the chaff more efficiently than we got here. Episodes lack conflict, lack resolutions, have holes in logic, etc. There are some good shows, but the clunkers really drag it down. The best part of TAS, without a doubt in my mind anyway, is the ability to revisit stories and locations from TOS. I wish some of these had been live-action shows. Come on... "Yesteryear" starring Leonard Nimoy in Season 4 of TOS? Sign me up.